MAX CARB is a highly soluble complex of diversified oligo- and polysaccharides, enriched with electrolytic elements which are necessary for maintaining high performance. The product efficiently replenishes the energy used up during your workout, prevents dehydration and accelerates the recovery rate of the organism after the training. 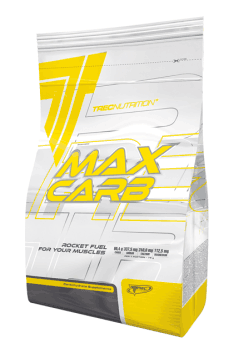 MAX CARB is an advanced carbohydrate formula, especially recommended to people practicing endurance and strength sports. It increases the strength and endurance during long and demanding workouts. Acidity regulator (Citric acid, Malic acid), Flavors, Sweeteners (Sodium saccharin, Sodium cyclamate), Coloring agent for lemon, orange and peach flavors - Beta-carotene, Coloring agent for currant flavor - Azorubine.